Country style furniture at its finest, the Ruff Sawn Ledge Rock Bed is a masterpiece in fine woodworking. Offering all the rustic appeal you love, this natural, solid wood bed makes a statement in your master bedroom or guest room. 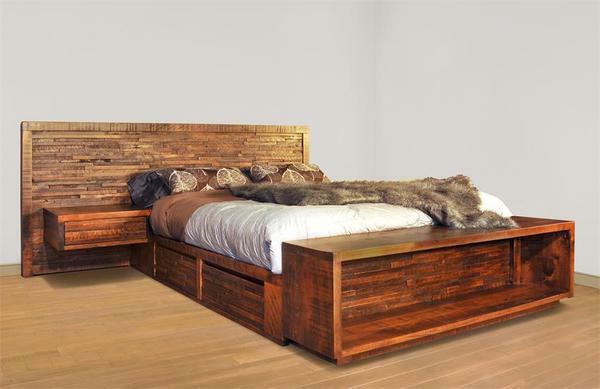 With rough sawn lumber to add a "wow" factor, this bed offers a warm welcome combined with superior Amish craftsmanship. Full of options to offer storage and display space, you can't go wrong investing in this lovely bed. The Ledge Rock Bed is shown here in rough sawn wormy maple wood with late harvest stain. Lumber that is "rough sawn" displays the wood in its most natural state. This includes the presence of surface imperfections like saw marks and pin holes that give it that rugged appeal. Take a look at more rustic style furniture from our Ruff Sawn Collection here.